Uses: Important ore of arsenic, minor source of gold and as mineral specimens. A major ore of arsenic, Arsenopyite can contain a small amount of gold as an impurity. Although an ore of arsenic, it is not intentionally mined for that reason. In processing the ore of other elements some arsenopyrite is "accidentally" included and gives off its arsenic as fumes that are then recovered. This "accidental" source supplies most of the world's needs in arsenic. 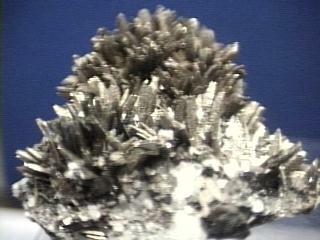 Arsenopyrite makes attractive mineral specimens as well. It's well formed crsytals show a distinct and interesting crystal form. A typical crystal contains a diamond shaped dome atop a prismatic crystal. The crystals have sharp acute angles that are a marked contrast from other sulfides that generally have only obtuse angles. Color is a brassy white to gray. Crystal Habits include prismatic crystals with a diamond cross section terminated by either a steep dome (actually two of the four faces of a prism) or a less inclined dome, also short stubby crystals doubly terminated with domes. Twinning is common, often bending the crystal and sometimes forming crosses, x's or stars. Cleavage is distinct in two directions forming prisms. Hardness is 5.5 - 6. Other Characteristics: Striations on dome faces, bitter smell when powdered or broken. Associated Minerals are gold, siderite, pyrite and other sulfides. Notable Occurrences include Kyushu Island and Iname, Japan; Cornwall, England; Bolivia; Freiberg, Germany; Wawa area of Ontario, Canada and Valais, Switzerland. Best Field Indicators are crystal habit, cleavage, smell when struck, color and luster.